Touring Egypt 12: Would you believe, it must have been Saturday night? Or something about “once a week, whether you need it or not?” OK, that was a couple of throw-away jokes for Americans there … sorry, I guess. 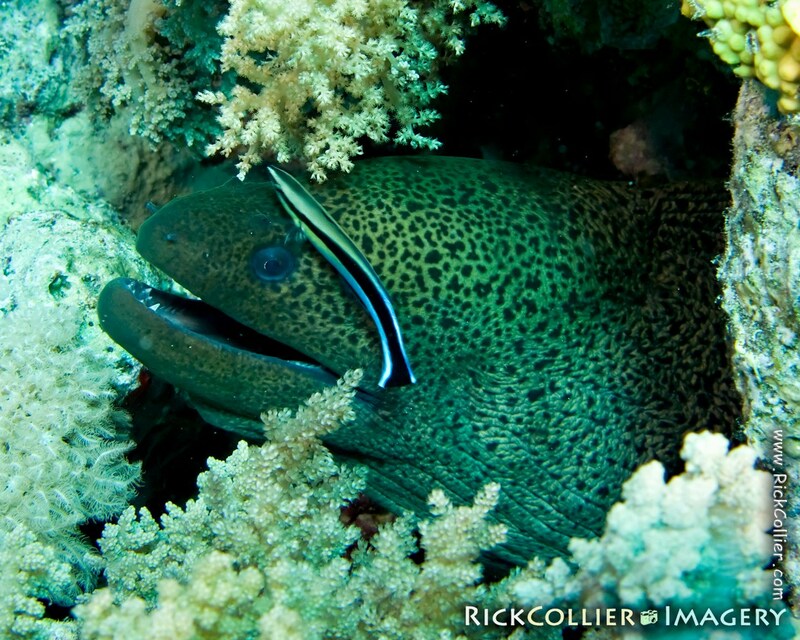 Here is another sight that is striking but not very uncommon in the Red Sea, if one pays attention. There are many “giant” moray eels here. They are often spotted swimming freely across the reef. Likewise, the reefs are full of the local cleaner fish and shrimps. (If you are careful and patient, it is possible for a diver to coax a fish or shrimp to “clean” one’s hand.) On several occasions I have seen the large eels in cleaning stations, being worked over by the Red Sea’s indigenous cleaners. Photographing the scene is a bit more challenging: The giant morays are not comfortable being approached, nor is the cleaner. I have scared away one or both almost as many times as I have seen them. 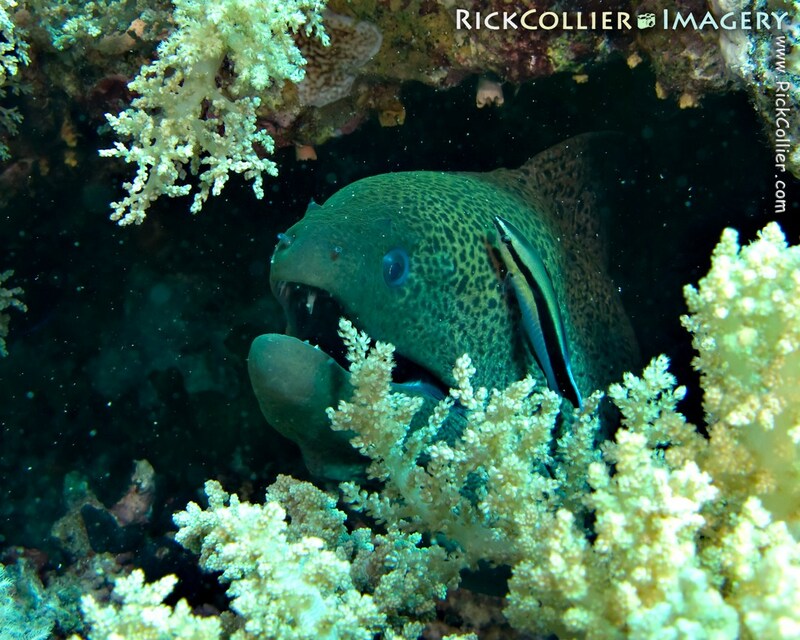 This was taken on a boat dive to “Yolanda Reef,” in Ras Muhammad National Park, Egypt. There is often a strong current at this site. On this particular day the Camel Dive* boat crew calculated well and dropped us perfectly in position to ride the current on a nearly effortless drift between Yolanda and another nearby site, “Shark Reef.” In this situation, a photographer who is paying attention and drifting quietly can ride the current rather than having to swim up to his subject. I saw the eel first, then realized he was stationary because he was being cleaned. As the rest of my group passed by, I exhaled a little to drift closer to the reef and waited for my moment. I took two shots as the current carried me past. *In the category of “too many times can’t be enough:” As I’ve mentioned previously, when in Sharm el-Sheikh I stay at and dive with the Camel Dive Club and Hotel, a full-service PADI training facility with fabulous and friendly staff, and also excellent accommodations and great dining on premises. This entry was posted on Thursday, September 3rd, 2009 at 15:22 PM. It is filed under thePhotoTourist, Underwater and tagged with cleaner, coral, coral reef, Egypt, fish, giant moray, giant moray eel, moray, moray eel, Ras Mohamed, Ras Muhammad, Red Sea, Red Sea cleaner wrasse, Touring Egypt, Underwater, wrasse. You can follow any responses to this entry through the RSS 2.0 feed.